Representatives for Simply EZ and Lifeline were at the Tomorrow Center Resource Fair. CARDINGTON — Tomorrow Center students and staff welcomed the community to a program showcasing area agencies and businesses last Thursday afternoon at the Tomorrow Center. 42 agencies and businesses had representatives who spoke with Tomorrow Center parents and community residents about their services. Many gave flyers and brochures as well as pens, water bottles and other souvenirs. Dr. Leslie McDougal’s staff said they gave out 100 goody bags filled with toothbrushes, toothpaste and floss. 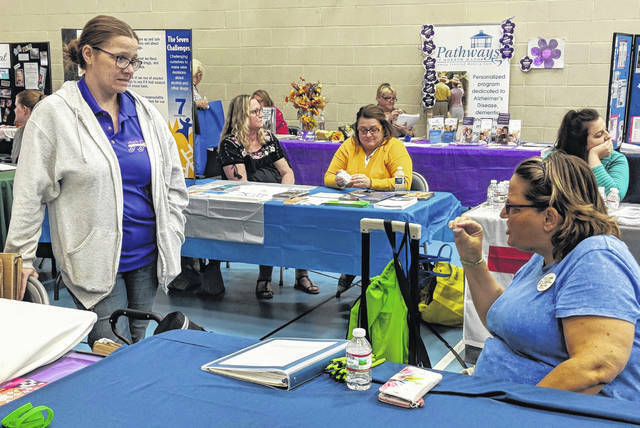 Tri-Rivers and Marion Technical College representatives were present as well as several counseling and mental health agencies such as Syntero, Ohio Guide Stone and Maryhaven. The event ended with the Tomorrow Center staff drawing the winning raffle tickets for 40 theme baskets provided by local agencies and businesses. Tomorrow Center Community liaison, Suzie Sexton thanked all who donated baskets for the raffle and cakes and cookies for the bake sale. The Tomorrow Center is an open enrollment, community-based school in Cardington. The school serves students in grades 6-12 and has students from all the Morrow County School Districts as well as surrounding counties. The school focuses on academic, social and mental health needs of students. For information about the school visit their website: www.thetomorrowcenter.org.